Eyes are one of the most sensitive organ in the body. It provides one of the basic and most important sense: the sight. Yet, the eyes are exposed to many dangers: visible and invisible. Lead or radiation glasses are specifically designed to shield the eyes from the invisible dangers; that is, radiation. Medical personnel and scientists focusing on radiology are the ones who mostly need lead or radiation glasses. Lead or radiation glasses are classified based on its physical appearance. Listed below are the types of lead or radiation glasses. These glasses have a curved frame that wraps the head. These types of glasses have thick, protective rims that surrounds the eyes. Usually, these glasses have a band that extends from temple to temple or from the end of one arm to the other. These glasses fit tightly in the user’s head. These glasses are the type which could be put over spectacles or prescription glasses. These glasses also have thick rims and temples, as well as wide and flat arms. These are lead or radiation glasses that are sold for a cheaper price, but protection is never compromised. Usually, the material for the frame is made of cheap plastic or very thin metal. Many models have side shields on. These glasses are made by fashion designers. The glasses employ chic and classy frames ready for runway. The principle behind lead or radiation glasses is lead shielding, hence, the name. Lead is a heavy metal with high atomic number and high density. The lead could carry a high positive charge and there are more electrons it could accommodate to maintain a neutral charge. Also, its small atomic radius results into a denser packing where lead atoms sit close together. On the other hand, radiation has a dual nature: it travels in waves and acts as a particle in the form of photons at the same time. X-rays and gamma rays are strong forms of radiation because it travels in higher frequencies and, therefore, carries higher energies. As these rays meet other materials, the electrons of that substance catches some of the energy brought by the photons. For example, the substance exposed to radiation is the human eye. As the eye encounters x- or gamma rays, the electrons present in its tissues become energetic and active. It could do damage to the deoxyribonucleic acid (DNA) – the genetic makeup of the human body. Damage to the DNA sequence could result in different kinds of diseases such as eye cancer. With lead incorporated into or coated onto the lenses of radiation glasses, the radiation is caught by the highly positive lead atoms. The energy of its photons is absorbed and/or scattered by the lead atoms. However, the lead atoms only have a certain capacity on which it could absorb and/or scatter these high-energy waves. It could degrade from long-time exposure. Also, lead can’t shield the eyes from higher forms of radiation like beta- or neutron radiation. It could stand up well to gamma and x-rays, though. The most important thing to look for in lead or radiation glasses is the capacity of its lenses to absorb or scatter radiation. This is determined by the concentration of lead atoms embedded into or stacked onto the matrix or surface of the lenses. The thickness of the lead coating indirectly relates to the longevity of the glasses’ effectivity to absorb and/or scatter radiation. Second is the design of the frames. The frames shall employ thick rims that, as much as possible, fully surround the eyes, and should fit tightly to the user’s head. This is to prevent incident and scattered radiation from entering from other openings that leads to the eyes. It is important that the glasses have wide temples and flat arms or side shields, at least. Other factors that a consumer should look for is the weight. The weight increases as the lenses get bigger in size. The lenses may be bigger in size, but the weight then pushes forward until the glasses can’t sit comfortably on the user’s nose. Thus, it is not always the best case to have larger lenses. Comfort and ergonomics shall also play a vital role. Protection to the eyes shall not compromise the ease of working with the glasses on since discomfort could tempt the user to remove the glasses or not use the glasses at all. Color could also be a factor in a professional setting. An employee shall abide by the rules and regulations set by the company such as color coding. For some visually-impaired individuals, prescriptions are important to maintain visual acuity. 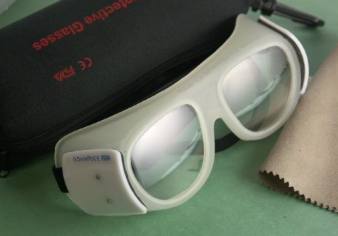 There are radiation/lead glasses that have prescriptions matching what the user needs or they could opt to have fit-over glasses where they could prescription glasses beneath. With the use of lead or radiation glasses, the medical personnel or scientist conducting the radiation analysis could have their eyes protected from the harms brought by x-rays or gamma rays. The ailments and disorders that could be prevented are various forms of cataracts, macular degeneration, blindness, eye cancer, etc. 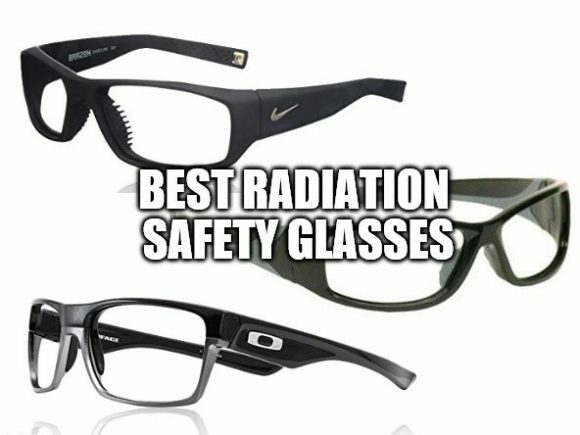 Here is the list of the best radiation glasses that you can take advantage of. This list is based on the effectiveness, durability and affordability of the eyewear. 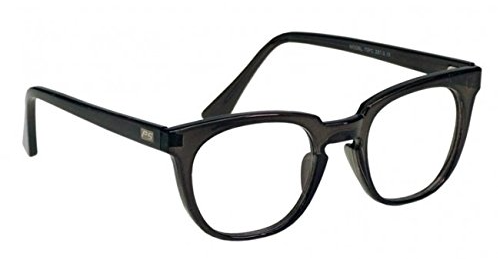 This specific eyewear is mainly designed for medium and large faced users. However, this doesn’t mean that it can’t be worn by other people. To start with, the frames are made of a durable approved material. This material is almost impact-resistant making it effective, durable and serves the users for a very long time. It also eliminates the doubts of breaking or getting destroyed. Having been designed from a super durable material, this product is durable and can last for a very long duration of time. The shape of this Nike Brazen Radiation Glasses is universal. Moreover, any person with different facial shape can effectively wear them and be comfortable at the same time. The lenses are designed with proper design and made by the most experienced opticians in the USA. Moreover, the brand is equally and largely known for its proficiency. These lenses use the ultra-refined lead oxide to ensure that they effectively protect the eyes against all the harmful substances. Scattered radiation on most occasions is not actually good for the eyes. In this case, these particular lenses are designed with the capability of protecting the eyes against these scattered glares. To be specific, it protects the eyes against the scattered radiation on 99.9% effectiveness. The frames are safe and durable. This information is verified by both the users of this product and the maker. The frames are made with a titmus standardized material that give its lengthy durability. These frames are designed with a top capability of making them even more comfortable compared to other radiation glasses. They are designed with a desirable dimension thus making them fit for the users face. Moreover, it comes in smoke gray nylon equipped with removable shields. This is a top feature that everyone should be aware of. The lenses of this specific product are standardized with .75 Pb lead equivalency. They are high-lite transmission lenses with more 20% more visible light. The lenses are able to offer the protection that they are designed for without any hesitation. Moreover, it is also 1.80 high indexed. This enhances their performance and makes them even more ideal. It also weighs for 12 ounces which is a little bit heavier compared to other radiation safety glasses. The fact that they are a little bit heavy is logically good, this is because the technology in which they are designed with makes this possible. Actually, not all radiation glasses are made with a perfect lightweight design. But these glasses is designed with a lightweight and comfortable design to ensure that the user barely feels them. This is because the material used to make it is nylon based which is light yet sturdy. This radiation protection glasses are designed and provided with a nose pad to ensure that the users enjoy the comfort while wearing them. The rubber nose pad also makes the radiation glasses more comfortable compared to the ones that don’t have the nose pad. Rubberized temple bars makes you barely feel the presence of these radiation protection glasses. Plus adding the lightweight feature, it automatically becomes one of the best in terms of comfort. These rubberized temple bars provide comfortable grip while the wrap around design ensures that your eyes are fully protected. Talking of functionalities, this is one of the features that make this eyewear effective and perfect. The fact that the lenses are standardized with .75Pb lead equivalence makes them even more ideal to be used for the radiation protection use. These high transmission lenses are designed and made with a 20% more visible light. In this case, they offer clarity when being used. To start with, the frame is designed with durable and quality vinyl frames. It ensures that the users enjoy a longer duration of service. Basically because these types of glasses are made to serve a specific role, having them designed with pristine theme color is not often common. This product however, despite of being designed and made to protect the eyes against the radiated and scattered rays, they are also designed with a beautiful theme. Having radiation protective eyewear that fits over other normal glasses is the best deal a glass enthusiast would wish for. This product therefore, is designed to meet this purpose. For this reason, most users prefer this glasses over other radiation protective glasses. One of the best feature linked up with the lenses is the ability to offer the .75mm Pb lead equivalence. This feature assists the product to effectively protect the eyes against harmful rays. This product is designed and made with this feature that assists it to offer effective light transmission capability. This product is designed with the intent to effectively protect the users’ eyes mainly against the harmful radiation rays. Other than that, these type of eyewear helps in protecting the eyes against reflected and scattered rays. These frames are somewhat impact resistant and rarely break due to simple or mild impacts. This feature is essentially fine and makes them last long and serve the user for a longer duration of time. The material used is very light. This in return makes the users feel that they are not wearing anything. This is a very enticing and proper feature that most of radiation protecting glasses prefer. The frames are sturdy and fits very well. In this regard, the material is strong and somehow impact resistant. Moreover, the frames are designed with a fitting design to ensure they fit almost every user. Basically, the glasses are made with a wrap-around design that ensures that they maintain grip on users face and lowering the chances of falling off. It also ensures that the eyes are essentially fully protected. Since this eyewear is designed to protect the eyes against the radiation, the lenses are standardized and made with .75Pb lead equivalence to ensure that it really meets its objectives. Other than offering premium protection to the eyes, the eyewear, is made with a high transmission design to ensure that it increases the visual light. This is important and ensures that users enjoy the benefit of a clear vision. The lenses are also 1.80 High indexed to supplement on their effective eyes protection capability. This radiation protective glass is tested under fluoroscope and they effectively work just quite fine. Moreover, it also ensures that the x-rays don’t reach users eyes. The frames of the RG-703 radiation glasses are designed with a super light nylon material. This is a super feature that any of the users look up to. Having a lightweight eyewear is the best feeling because most of the users are people who are always engaged with handy activities. Lightweight glasses therefore offer comfort every time they are undertaking their activities. Talking of comfort, rubber nose pads are provided along to enhance the comfort of these glasses. Not many radiation glasses are designed with this rubber nose pads. For this reason, this specific product wins the luck and ensures that the users are contented with it. It is designed with a pristine wrap-around design to ensure that it adopts a desirable fantastic look, as well as making sure that the lenses protect the eyes from every angle. This design ensures that no rays are getting access to the eyes. In this case, the users are ensured of a full protection without necessarily worrying about anything. Since quality is of great paramount when purchasing any particular product, this radiation protective glasses is made with quality frames to ensure that they last longer without any damage. The material used to make is light therefore ensures that these glasses are effective and they necessarily do not bother the user when wearing them. Since most glasses are designed with a high tech lenses, they are made of a heavy material to ensure that they effectively protects the eyes against all instances of radiation lights. Despite the fact that these frames are light, they are also sturdy. The makers of this product ensure that they offer the customers the best glasses by ensuring that the lightweight frames are made firm. This feature is enhanced to ensure that they perform to their best level. For unsurpassed protection, quality and optical clarity. Since most of the radiation protective glass users are usually based and concentrated in closed rooms, light transmission somehow becomes a challenge. To ensure that optical clarity is efficient though, this product is made with the capability of transmitting light on an increased 20% rate. This feature however, is not commonly found on most of the radiation protective glasses. Not many of the eyewear are made with this feature. Luckily this feature is present in this specific product. It blocks 99.9% of the scattered radiation generated during fluoroscopic procedures, among other procedures. Durability is one of the most important feature that we should consider. This will ensure that the eyewear will last for a long period of time. In this case, this eyewear is made with durable frame material that will ensure that the users enjoy the benefits of the services for a longer duration of time. Most of radiation glasses are designed with leaded lenses in order to ensure that they effectively protect the eyes. The lead is used to ensure that all rays are blocked and prevented from reaching the user’s eyes. This is a crucial feature that makes this product achieve its functionality fully and efficiently. Moreover, the lenses are designed with a different technology from other glasses to offer effective services. As stated earlier, it is usually made using high technology and designed by top eye specialists to ensure optimal performance. Moreover, the lenses of this specific eyewear are designed with lead coating to ensure that no rays reach the users eyes. The chances of having slight rays having their way to the eyes is also close to void since the glasses are made with wrap-around design to ensure that they fully cover users’ eyes. In this regard the functionality is enhanced at a high rate. Despite of being designed and made to support and hold complex radiation protective lenses, the frames is designed to ensure that they do not bother the users every time they are wearing them. Since radiation glasses are usually worn and used by health practitioners mostly in radio activity procedures, the frames needs to be comfortable and lightweight. For protection and durability, the glasses are provided with retention straps to ensure that they are always attached and close to the user. The retention straps also acts as a way of maintaining the glasses within the users’ reach every time they are temporarily not wearing them. 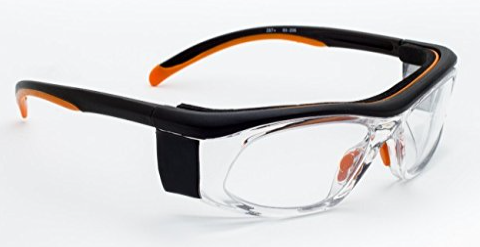 The straps moreover enhances the durability since the chances of having the glasses slip of the users face and falling off are reduced to zero. This accessory therefore, enhances this product. This is a very important feature that ensures that it performs on its best level. The ultra-refined lead oxide lenses secure that they provide optimum protection for the eyes. Despite the fact that these lenses use ultra-refined lead oxide, they are also designed with the standard of .75Pb lead equivalence to enhance the performance and fully protect the users against harmful rays. What could be more important than having adjustable temple bar on any eyewear? Well, I think this is one of the best features about it. The adjustable temple makes it easy for any user with different face size to have them on comfortably. Since most users are linked to serious lab works, comfort is of great essence. Having glasses that you can adjust any time that you feel like is the best idea. 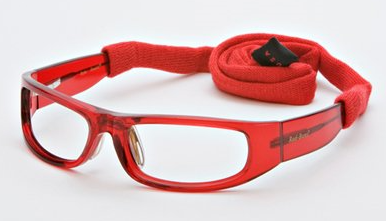 This eyewear is designed with a narrow fitting frame to effectively fit both men and women. Since most of radiation eyewear is designed with a large frame, they sometimes become too big for medium faced users. This is the reason why it is designed with such a fitting frame to accommodate all users despite their face sizes. The frame’s wrap around design helps the lenses to cover the eyes on all dimensions. The essence of having such eyewear, is the fact that they are capable of protecting the eyes against radiation, reflected and scattered rays. This feature therefore meets the requirement of reducing the radiation. When using this product, you are guaranteed of the 92% visible light transmission, with an abbey value of 40. It is therefore designed and made to ensure that it address the light transmission fault on other products. These are just some of the best radiation glasses that you can use to protect your eyes against the harmful radiation. Personally, I prefer the Schott SF-6 HT Wraparound glasses and Phillips Model RG-703. They are just simple in design and durable. Plus the price is reasonable considering the protection that it can give. The use of lead or radiation glasses effectively reduce radiation that could enter the eyes. It is very important to protect the eyes of medical personnel and scientists exposed to x- or gamma rays since these are energetic and harmful rays that could pose harm to the eyes. If you have more questions and concerns about these glasses, feel free to comment it below. I would also be happy to hear some experiences about the quality and performance of this product in protecting the eyes against radiation. Very informative, I usually go out and buy the cheapest pair of radiation glasses out there, but after reading your article I realize that there are other things to take into consideration when looking for an eyewear. Even the differences in the frames. I am saving your site for the next time I buy radiation glasses. I will read your review again to make a purchase of the glasses that will work for me. One question, I have a wide head and glasses are hard to fit. Do you have wider models? Actually, all of these radiation glasses are big enough to fit almost all head sizes. But just to make sure, just double check in the specifications for the size of frames.